Human senescence patterns – late onset of mortality increase, slow mortality acceleration, and exceptional longevity – are often described as unique in the animal world. Using an individual-based dataset from longitudinal studies of wild populations of seven primate species, we show that contrary to assumptions of human uniqueness, human senescence falls within the primate continuum of aging, the tendency for males to have shorter lifespans and higher age-specific mortality than females throughout much of adulthood is a common feature in many, but not all, primates, and the aging profiles of primate species do not reflect phylogenetic position. These findings suggest that mortality patterns in primates are shaped by local selective forces rather than phylogenetic history. 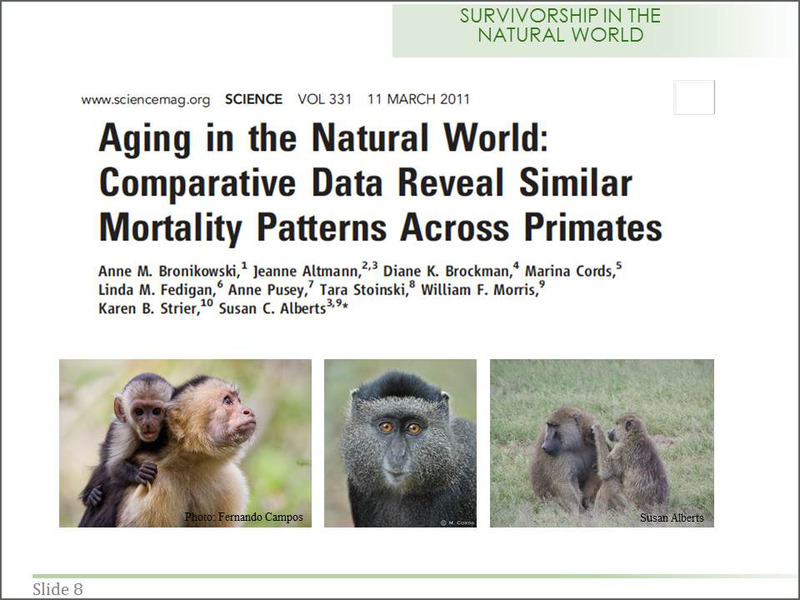 Bronikowski AM, Altmann J, Brockman DK, Cords M, Fedigan LM, Pusey A, Stoinski T, Morris WF, Strier KB, Alberts SC (2011) Aging in the natural world: comparative data reveal similar mortality patterns across primates. Science 331(6022): 1325-1328. Atteh Akoto onto Additional resources for teaching "Survivorship in the Natural World"
Additional resources for teaching "Survivorship in the Natural World"
This collection is to be used to help teach Survivorship in the Natural World.